In 1969, Romare Bearden (1911–1988) participated in Blocked Metaphors, a group exhibition mounted at the New York gallery Cordier & Ekstrom.1 Like the other invited artists, Bearden was given a hat block with which to work; this millinery industry form was the basis for each project made for Blocked Metaphors. 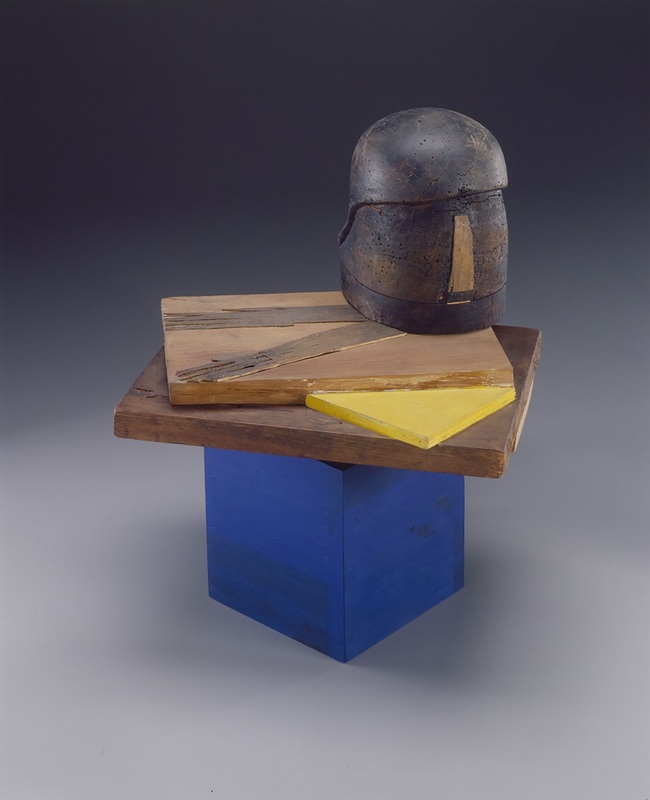 Bearden set his wooden hat block precariously atop a few staging elements: a painted blue cube measuring almost a foot in height and a couple of placemat-shaped pieces of wood. He titled the construction Mauritius (fig.1), which undoubtedly referenced the saint represented in Christian iconography. Considering the era of its making—the decade of the Vietnam War and resistance to it in many national capitals, anti-government protests across the globe, and both nonviolent and armed uprisings against institutional discrimination and social inequity—Mauritius provokes questions about human conflicts, their histories, and their costs. Yet the assemblage offers no answers. Instead, it exists as an austere statement of abstract figural forms—some dramatically simplified, others emphatically exaggerated, and all creatively brought together in a manner that announces that it is made of parts that do not entirely comprise a whole. This essay takes on the structure of collage, too. It consists of juxtaposed parts, including the reported facts about the Blocked Metaphors exhibition and the suppositions generated by the title and form of Mauritius, a project about which we have found no commentary from the artist, and whose current ownership is unknown. Twenty-five artists exhibited in Blocked Metaphors, a showing of contemporary art. Cordier & Ekstrom was known for its support of School of Paris modernists and of artists whose careers took off after World War II. To wit, Bearden’s watercolor and ink drawing He is Arisen (1945) was acquired by The Museum of Modern Art in the year of its making, and Bearden secured gallery representation with Kootz Gallery during that decade as well. Still, Blocked Metaphors participants include artists—senior and junior to Bearden—with higher profiles: Arman, William Copley, Nancy Grossman, Robert Indiana, Jasper Johns, Roy Lichtenstein, Richard Lindner, Man Ray, Marisol, Louise Nevelson, Alphonso Ossorio, James Rosenquist, Saul Steinberg, and Andy Warhol. In 1969, Bearden would have been seen as a reemerging artist, one who resurrected his career earlier in the decade. He did so in part with the collages and photomontages that he exhibited in group exhibitions, those that he curated of black artists’ work and those organized by venues such as Cordier & Ekstrom, which generally showed the work of white male artists of European descent. Arne Ekstrom and his business partner, Daniel Cordier, a Paris-based gallerist, also backed younger talent who, unlike those listed above, are nearly forgotten figures today. Their names are not represented in current art history surveys and accounts of New York avant-gardism in the 1960s. Among them are the abstract painters Alfred Jensen and Regina Bogat, who were husband and wife; assemblage and mixed-media artists Varujan Boghosian and Suki Sivilax; Pop artist Nicholas Krushenick; and realist illustrators, graphic designers, and printmakers Martin Carey, Cliff Condak, Peter Dechar, and Bernard Pfriem. The Blocked Metaphor roster is a testament to the Cordier & Ekstrom mission of engaging different generations of transatlantic twentieth-century artists who were developing fresh, postmodernist practices. Bearden was one of them. He first met Cordier, and then his business partner Michael Warren, in November 1959. Two months later, they gave Bearden a solo exhibition at New York’s Michael Warren Gallery, featuring his large abstract paintings. By 1961, Bearden had come to an agreement with the newly formed gallery of Cordier & Ekstrom, Inc. Enthusiastic about the small collages Bearden was making, Ekstrom encouraged him to make photostatic enlargements of them. In 1964 these works, called “Projections,” were shown in a Bearden exhibition bearing this title at Cordier & Ekstrom, and it brought great attention to his unique practice: modernist collage put in the service of postmodern figuration of mostly people of African descent, contemporary and of a volkisch past, in urban and rural settings. Prior to the opening of Projections, Ekstrom, impressed by the work’s power, had started planning to send the show to Europe.2 While this tour never came to pass, its ideation is a good illustration of the Cordier & Ekstrom vision for marketing their artists’ works. There was another consistency among these interpretations of Blocked Metaphors: the works the press called out into discussion. The New York Magazine list is a roll call long and short on details: in it, the output of Arman, Boghosian, Carey, Copley, Grossman, Indiana, Jensen, Johns, Krushenick, Lichtenstein, Lindner, Man Ray, Ossorio, and Steinberg were “fabulous.” In contrast, Man Ray’s L’Imposteur, with its mortarboard and sunglasses, was reproduced in two publications and noted for its send-up of the blockheaded intellectual. Reviews also cited the contributions of Johns, Steinberg, and Warhol, and the mention of the asking prices—$9,000, $5,000, and five cents, respectively—which demonstrated the authors’ incredulity about the market for assemblage, a format that they so clearly believed was not as skillfully wrought as the best in conventional painting and sculpture. Perhaps too racy for Time’s middle-class national audience, Grossman’s work was one the newspaper journalists took pains to describe. For Glueck, it was “a needle-toothed monster” and Canaday called it “a sinister mask.” McDonagh’s assessment was more vivid: “Nancy Grossman, who normally works with leather helmets fitted on to plaster busts, inserted a glowering set of animal’s teeth in the front of her mask-enclosed block to create a wolfish motorcyclist.”9 The New York Magazine comment was similarly designed to this artist’s provocative practice: “Grossman, best known for her heads swathed in black leather with bikers’ chains and grommets, took two blocks and combined them into her snarling Tasmanian Meanmouth.”10 This written appraisal was accompanied by Alix Jaffrey’s photograph of Grossman’s assemblage and three more from Blocked Metaphors, identified by captions: Carey’s Owl’s Head, Man Ray’s L’Imposteur, and one identified as “the pure hat block” that was featured in the show as a didactic example of the archetypal form. 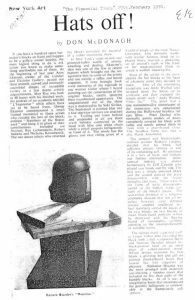 Canaday proposed that the last work—“unadorned and unchanged” from its purposeful state, was the best, for it looked “very much like a Brancusi.”11 It was the sole illustration for the Times review, and Ossorio posed with it and two other hat blocks for the Time feature. 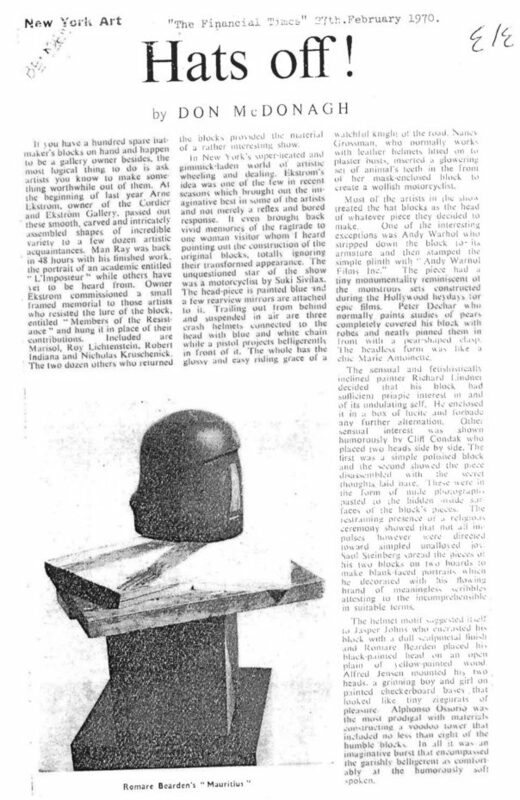 Bearden earned a single mention in the contemporaneous response to Blocked Metaphors, and it was from McDonagh, who lumped Mauritius in with Johns’s untitled work because of their similar form: “The helmet motif suggested itself to Jasper Johns who encrusted his block with a dull sculptmetal [sic] finish and Romare Bearden placed his black-painted head on an open plain of yellow-painted wood.”12 And though for McDonagh “the unquestioned star of the show was a motorcyclist by Suki Sivilax,” Mauritius was the only illustration for his full-page review, and it took up more than a third of the space (fig. 2). It was a curious choice by the Financial Times editors, to reproduce this colorful work on the broadsheet newspaper’s signature salmon pink pages. Color, most evidently, is a critical visual element of Mauritius. Its browns and tans are natural and naturalistic shades associated not only with the organic material of wood and the application of stain to it, but also the skin tones of tanned bodies and people of color. Bearden’s other chromatic decisions are the choices of a figural abstractionist. Yellow complements blue and simultaneously forges an analogous color relationship with the wedge-like nose and horizontal slit that signifies a mouth. The ultramarine cube acts like the trunk and legs of a standing body. The Financial Times photograph of Mauritius, probably taken at the Blocked Metaphors exhibition, shows that the blue cube was positioned on a pedestal, making the assemblage insistently vertical. Even so, the blue hue of Mauritius pulls and pushes our perceptions in different directions. The cool color of the block—a heavy and unmoving form—makes the overall work appear to recede and move away from the observer, like ebbing and flowing tides. Blue was a fount of symbols and associations that Bearden knew and likely sought to invoke. During Bearden’s lifetime, the French painter Yves Klein strategically used monochrome blue in paintings, sculptures, and performances, developing what he named International Klein Blue. Bearden might have seen Klein’s work in France, which he visited several times, including in 1961—the height of the French artist’s career. Bearden also may have seen Klein’s work in New York, where black Trinidadian curator Kynaston McShine organized the critically acclaimed retrospective Yves Klein at The Jewish Museum in 1967. Rhetorically high-minded in the pursuit of immateriality and utopianism, Klein’s ambitions also were expressed with irreverence—a tenor Bearden’s never strike—and they were meant to question the value and uniqueness of the art object, interrogations that Bearden never articulated. Instead, Bearden’s Mauritius and the majority of his mature paintings, collages, and prints are utterly sincere. Figurative and abstract, Bearden’s work—in image and in title—are tied to what he believed were universal narratives and human experience. Therefore, the blue in Mauritius may reference not only Klein’s project but also the portrayal of the Virgin Mary. The figure of Mary is rendered in blue garments in Bearden’s painting The Visitation (1941; Museum of Modern Art): Bearden followed the traditional depiction, established during the Italian Renaissance, and the conveyed association with purity, peace, humility, and calm. Blue has been used to signify divinity and celestial space in Buddhist, Christian, and Islamic art traditions. Since the mid-twentieth century, Americans have read blue as the color of masculinity, a connection that Bearden likely hoped audiences would make. A more arcane matter, but probably known to Bearden, was that blue pigment was manufactured in the ancient world by the Egyptian forebears of Maurice. Bearden’s decisions about shapes and lines also configure the body and attributes of the warrior Maurice. 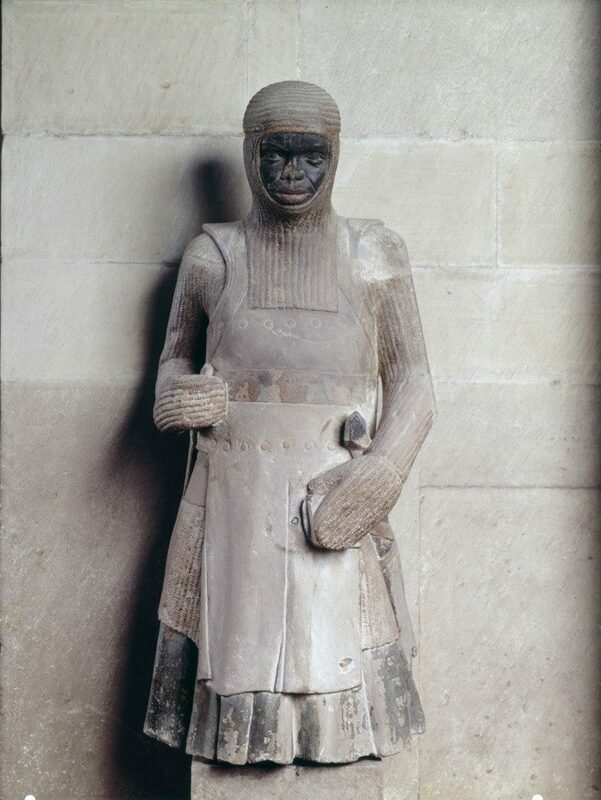 The bright yellow triangle suggests the spear tip and the arrow head, and the pointy outline of the medieval European kite and heater shields all often represented attributes in paintings and statues of St. Maurice. In Mauritius, the strong contour lines of the hat block are reminiscent of the outsized human heads presented in Bearden’s expressionistic paintings and drawings of the late 1930s and 1940s, among them He Is Arisen (1945; Museum of Modern Art) and The Visitation. Bearden’s strategy of deconstructing heads and hands was prominent in his breakthrough mixed-media works of the 1960s, such as Prevalence of Ritual: Baptism (1964; Hirshhorn Museum and Sculpture Garden, Smithsonian Institution) and Conjur Woman (1964; Museum of Modern Art). Hands are expressive features in Mauritius, just as they are in Bearden’s prints, paintings, and murals.13 In this 1969 assemblage, hands are rendered flatly. Bluntly hewn and lath-like, they are firmly affixed to the board on which the hat block directly sits and are weighted down by it—a much heavier and darker form. That Bearden juxtaposed the cephalic hat block with these strange hands, situating the former at the vertex of the latter, is of course provocative. Nothing lays between the hands—instruments and receptors—and the head, where the brain directs the body. What do these hands, splayed in a “V” shape, mean to do? Do they to point back to the “Double V” campaign of 1942 to 1943, launched by the African American weekly newspaper Pittsburgh Courier to demand two victories—the Allied forces in World War II and anti-racist and civil rights campaigners in the American armed forces and on US soil?14 Do they communicate either victory or surrender, signs that would be broadly apropos to the subject of war and conflict, events of the 1960s and the past—distant and ancient—including that of the martyr Maurice? 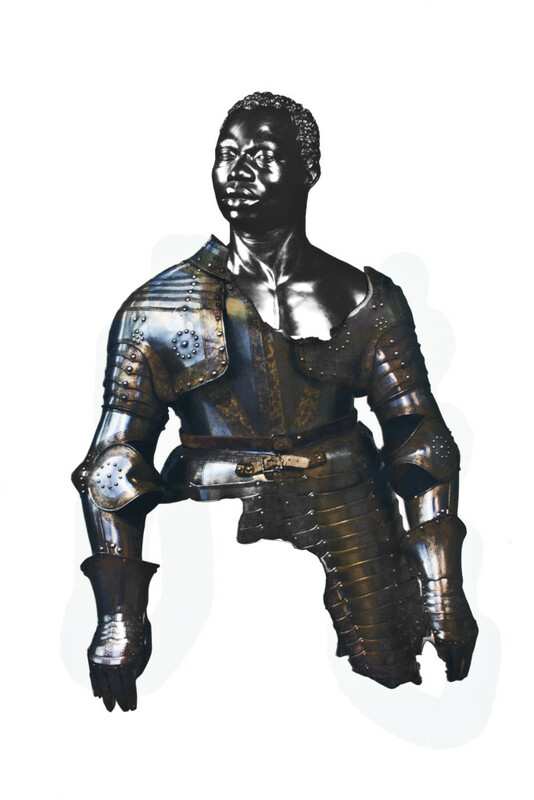 The best-known monument to St. Maurice rendered as a person of African descent is the eponymous statue of a chain mail–wearing knight (c. 1240­–50) installed in the choir of the Cathedral of St. Maurice and St. Catherine of Alexandria in Magdeburg, Germany (fig. 3). More than twice as tall as Mauritius, the Magdeburg Maurice is 43 11/16 inches in height. Over the centuries, it has suffered noticeable losses: its sandstone medium is abraded; paint has worn away in many places; portions of the nose have been chipped off; and absent are the legs on which the figure once stood, as well as the object implement it once held in its right hand. In a reduced state, the Magdeburg figure is drawn into an interesting conversation with Bearden’s Mauritius, which is a stark collection of juxtaposed elements. Political protest was a dominant strain of Bearden’s early work—panels and covers for black American weekly newspapers and monthly magazines in the 1930s—and occasionally in late-career, large-format projects such as Berkeley—The City and Its People (1973; City of Berkeley, California) and Captivity and Resistance (1976; African American Museum of Philadephia), which offered passages of a student rally (as a photo collage element) and identifiable revolutionary figures such as Joseph Cinqué, John Brown, Frederick Douglass, and Harriet Tubman, respectively.28 At a time when such imagery was being produced by his peers and by emergent political groups such as the Black Panthers and the Free Speech Movement, Bearden eschewed explicit signification.29 For Mauritius, his tack was oblique—its title was tied to a historical figure, and its form, arguably, to every fighting man—black and nonblack, of Bearden’s time and of all time. Constructed of materials felicitously given and found, Mauritius was imbued with the spirit of collaboration, creative association, and individual innovation provided by the platform of Cordier & Ekstrom’s exhibition Blocked Metaphors. As that exhibition title proclaims, literal readings were meant to be frustrated. Contemporary artist Stan Squirewell (b. 1978), in his own words, “looks for images of blackness everywhere in the world.”30 He photographs exhibited objects and pictures that he encounters during his visits to museums across the world and subsequently reorganizes these discrete parts into collages. As Bearden was, Squirewell was inspired by the legend of St. Maurice. Squirewell’s Maurice the Saint is a photo of Francis Harwood’s recognizable Bust of a Man (1758; The J. Paul Getty Museum), a black stone sculpture. In Squirewell’s composition, the figure’s head is seen in three-quarter profile and its left shoulder is exposed; sturdy medieval armor covers only part of the man’s trunk. Not only is the armored suit incomplete, but so is the warrior’s body below the beltline. Yet this muscular warrior is not entirely vulnerable. He is a formidable relic of past representation with relevance for the present, resurrected by Squirewell, interested as he is in presenting a virtuous and inspiring black masculinity. Therein lies the subtle difference between Bearden’s Mauritius and Squirewell’s Maurice the Saint. While both are fragmented forms, Squirewell’s naturalistically rendered figure holds the potential of becoming visibly whole and complete—like a computer graphic rendering—in way that Bearden’s Mauritius does not. Stubbornly object-like, Bearden’s assemblage, while named for a historical figure, is distanced from that flesh-and-blood person. Speaking about his paintings, Bearden once wrote “In my work, if anything I see connections, so that my paintings can’t be only what they appear to represent.”31 Extending that premise about painting to the sculptural Mauritius, we might conclude that in this project, he sought to make connections rather than delineations. Mauritius, unquestionably, is about something, and if we allow it to be, it can be about something else as well. Cite this article: Jacqueline Francis, “Romare Bearden’s Mauritius (1969): Wars, Nations, and Everything Else,” Panorama: Journal of the Association of Historians of American Art 4, no. 1 (Spring 2018), https://doi.org/10.24926/24716839.1630. This essay is dedicated to art historian Helen M. Shannon, PhD (1948–2018). About the Author(s): Jacqueline Francis is Associate Professor in the Graduate Program in Visual and Critical Studies at the California College of the Arts.